Haven’t decided on a hotel yet? 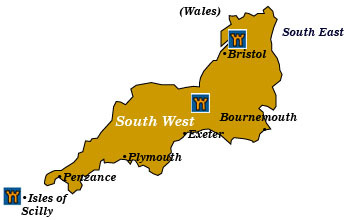 You can look at other available hotels in the counties of England’s South West—Cornwall, Devon, Dorset, Wiltshire, and Somerset with Booking.com. The West Country boasts some of the most beautiful and historic countryside in England. Here quaint villages are sometimes announced by the tall spires of their parish churches sighted in the distance, and at other times by an overshadowing medieval Norman castle. This is the domain of the legend of King Arthur and Queen Guinevere, and of Lorna Doone’s Exmoor—the beautiful wooded and heather-covered park where the red deer and wild ponies run free. With dramatic cliffs plunging into the sea, an inexhaustible list of sights to explore, and some of the more milder climate of England, towns and villages can often seem overrun with visitors. Make reservations during the summer season, take your time, and leave the car behind whenever possible to enjoy this magical region. Salisbury With its soaring spire (the tallest in England), Salisbury Cathedral is an utter masterpiece of Early English Gothic architecture. A visit to the Chapter House reveals one of the four surviving original copies of the Magna Carta. The cathedral close, or name given to the buildings surrounding the cathedral, offers some wonderful examples of architecture from several periods. A few miles to the north, the massive earthwork ramparts of Old Sarum was once the settlement of generations of Romans, Saxons, and Normans, who built a castle on the spot. Stonehenge The most recognizable stone ruins in the world, as well as a UNESCO World Heritage Site, Stonehenge holds the honor of England’s most mystical and evocative monument. Avebury A stone circle every bit as dramatic as Stonehenge (not as big but less visited), Avebury dates back to 2500 BC, 500 years after Stonehenge. Stourhead Although Stourhead’s great 18th-century (reconstructed in 1902) house houses a fine art collection, the surrounding gardens, lake, grottos, rare trees and plants are breathtaking. Wilton House Since 1542, Wilton House has been the home of the Earls of Pembroke. Designed by Inigo Jones, the staterooms of the great house lend themselves as sumptuous backdrops to various movies, including Sense and Sensibility. The Single Cube and Double Cube rooms are noted for their perfect dimensions. Lacock The National Trust administers this idyllic (except for the hoards of people that pour in) little village and abbey. Bath A UNESCO World Heritage Site, this elegant Georgian city is famed for its 1st-century Roman bath-and-temple complex. The Roman Baths and Pump Room Museum, is one of England’s most visited sites, as well as the Royal Crescent, a semicircular terrace of grand 18th-century houses. No 1 Royal Crescent is a magnificent example of Palladian architecture, with the museum inside exhibiting how the upper classes and those in service lived. Other attractions in Bath include the 15th-century Bath Abbey, the Jane Austen Centre (Austen lived at a number of addresses in Bath and used the town to a certain extent as a backdrop for her novel Persuasion and Northanger Abbey), the excellent (and fun) Museum of Costume, and the Holburne Museum, known for its outstanding collection of 17th- and 18th-century decorative arts. The Cotswolds Impossibly picturesque villages of stone cottages and dear little churches set among romantic and idyllic scenery, this is how the entire world imagines how England must be. Drive off the beaten track, rent a bicycle, or just start walking. Most charming places to visit? Try Snowshill Manor, Broadway, Chipping Campden, Lower & Upper Slaughter, and the estate of Owlpen. Sudeley Castle Favored by many Tudor and Stuart monarchs, the tomb of Catherine Parr, the last wife of King Henry VIII, is in the chapel house. Sudeley more resembles a palace than a castle, thanks to restoration efforts after Cromwell’s army left it in ruins. Accommodations in cottages on the grounds are available. Berkeley Castle Medieval through and through, you can visit the very room where King Edward II was murdered. The castle was built in 1153 by the Norman knight Roger De Berkeley, and the family has retained ownership ever since. In July, a jousting tournament and falconry demonstrations are held. Gloucester Cathedral Once the site of a Saxon abbey, this dignified and elegant Norman cathedral is the coronation site of Henry III in 1216 and burial place of Edward II. Glastonbury Popular with New Agers and legendary burial site of King Arthur and Queen Guinevere, the 8th-century Glastonbury Abbey has lain in ruins since Henry VIII’s dissolution of the monasteries in the 16th century. Glastonbury is now famous for its huge summer music festival. Wells A beautifully preserved medieval city, its glory is the majestic Wells Cathedral, one of the oldest Gothic churches in England. Exmoor National Park Over 700 miles of paths and bridleways cross moors of heather and bracken, wooded valleys, and along dramatic cliffs overlooking the sea. Corfe Castle A romantic history lasting 1000 years, including a six-week siege by the army of Cromwell, give an aura to the dramatic ruins of this castle. Maiden Castle Not a castle in the general sense, Maiden Castle is an enormous stone-and-earth hill fort dating back to pre-Roman times. Once a Celtic fortress, the Romans laid siege in AD 43. Exeter First occupied by the Celts, the Romans constructed a fortress here 2000 years ago. Despite intensive bombing during WWII, the medieval core is largely intact, with its great Gothic cathedral standing supreme. Powderham Castle Although the original manor was listed in the Domesday Book and the tower on the grounds date to the late 14th century, the main structure was built in 1739-69. This grand house is the seat of the earls of Devon. Luxurious rooms and noble exteriors appeared in the film Remains of the Day. Dartmoor National Park Rugged moorland covered with heather and gorse comprise one of the wildest and most desolate areas of England. Even Sir Arthur Conan Doyle was inspired to set his Hound of the Baskervilles here. Prehistoric remains, remote villages, and sightings of wild ponies make hiking (guided walks available) here a delight. Clovelly Although it’s been overrun with tourists for decades, the picturesque village of Clovelly still charms with its steep cobbled streets and brightly painted houses that look out to the sea. Pendennis Castle The largest castle in Cornwall, Pendennis was built by Henry VIII in the 1540s and underwent a 23-week siege during the Civil War. Across the way stands St. Mawes Castle. St. Mawes Castle Henry VIII built a string a coastal fortifications of which St. Mawes Castle is the best preserved and most elaborate. Tintagel Castle Lovers of the Arthurian legend have made a pilgrimage to this legendary castle of King Arthur for years, although evidence points to 12th-century origins. Celtic remains have been found on the site, which may have some relationship to the legend. The setting of the castle high on the cliffs overlooking the sea and the climb down to the beach and Merlin’s Cave make for a fun-filled excursion. Land’s End Walk out on the footpath to the edge of the cliff and watch the sea pound against the rocks below. Next stop: North America. Isles of Scilly 30 miles southwest of Land’s End, only 5 of the more than 100 islands are inhabited. If you’re looking for temperate climate, a profusion of flowers, unspoiled sandy beaches, rugged coastal scenery, and few cars, this is the place. St. Michael’s Mount Walk out on the causeway when the tide is low (there’s a ferry during the summer, otherwise) to reach this island out in Mount’s Bay. A steep climb will take you to a 14th-century castle, built on the site of a Benedictine chapel dating from the time of Edward the Confessor. The famed Mont San Michel off the French coast served as a model, and St. Michael’s Mount became a place of pilgrimage. Since the English Civil War, the complex has been the home of the St. Aubyn family. Lanhydrock Surrounded by 900 acres of wooded parkland, Lanhydrock is one of the great houses of Cornwall. Built in the 17th century by the Robartes family, it was rebuilt after 1881. Come here to gain a terrific insight into the below-stairs life of Victorian England. Eden Project Tropical, temperate, and desert biomes are home to 70,000 plants, including many rare and endangered species. The paneled geodesic domes are the biggest conservatories in Britain.